Hello my dear, TPP! The Racked articles were an interesting read- thank you! I have had only one warehouse sale experience, and that was a Beretta (!) warehouse sale. A reseller (you could just tell they weren’t a shooter) grabbed clothes from me as I was reaching for them on a table. When I saw them again they were at the cash register with two carts full upland and driven shooting apparel. A few days later I checked eBay and sure enough, the vest they grabbed from me was listed for four times as much as the warehouse sale price. And poor SBS. I have a few posts on that thread. I ordered four pairs of sandals from the anniversary sale and have been given the run around by the company. I spoke with them as late as this afternoon and got new information that completely contradicts what I was told two weeks ago. I’ve not yet filed a complaint with my credit card company but I think I’m at the point where I’m going to have to. I’ve been a loyal SBS customer for YEARS (Jacks don’t fit me) and am sad to say that these were the last pairs I will ever purchase. I’m moving on to Palm Beach Sandals, which I think is run by Stephen’s ex-wife. I’ve never expierianced a warehouse sale or had run ins with resellers but it sounds like they lack a soul. If I’m not willing to pay full price for something, I don’t need it that badly. I loved going to the sales when I lived locally. I never went on the first day so I didn’t really get to experience resellers. As someone who has no access to the sale now, it is frustrating seeing people buy the items and mark them up insane amounts on eBay. I think that Lilly has shied away from doing a permanent online sale section like other sites have because it “cheapens” the brand. I honestly think that they’ve cheapened the brand themselves. With how they do warehouse sales and having the merchandise float around eBay, etc. I know of people who think that Lilly isn’t worth it full price ever and will only buy it at the Warehouse sale. I think that Lilly would be much better off getting rid of the Warehouse sale but having a sale section online like most other clothing brands seem to. As far as Bonanno Sandals go, I was not able to purchase mine the day of the sale and was a little upset about it. Now 5 months later, I’m glad I couldn’t. I know so many people who ordered sandals and never got them and are upset. I read an article that talked about some legal troubles that Stephen Bonanno had and it mentioned him getting arrested in January. After reading that, I had almost wondered if that sale was just meant to be a quick way for him to raise the funds needed to make bail. Hello! I’ve been going to the warehouse sale for years, and while resellers have made the experience a lot less fun, what is missing from the stories is how the merchandise has gone downhill. I went mid-day on Friday, I waited maybe 20 min to get in. However, all the small items I.e. scarves, wallets, picture frames, were all the sorority line! There was hardly anything that was just Lilly. Also, the quality of these items was way below what I have come to expect from Lilly. I’ll probably go again, as I am always able to find something cute. This year it was a beach bag. But, I was very disappointed this year. Going to one sale a year isn’t a great loss for Lilly lovers. I ordered a pair of sbs and I received them maybe 2 weeks ago!! It took a while but was worth it!! 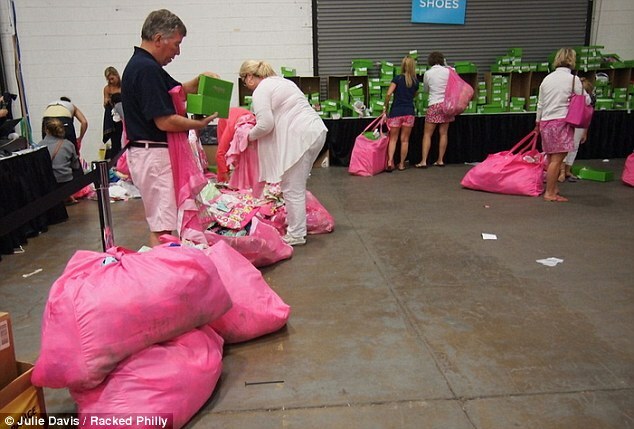 Ive always dreamed of going to a Lilly warehouse sale, but maybe I can give up the dream now. I sadly ordered three Bonannos (my first three pairs) during the sale using a prepaid giftcard I got for Christmas. Not sure I will be able to get the money back and am über disappointed. I used to go to the Lilly sale when it was in a small garage-type building and no one would show up…now it’s not worth my time to wait in the lines and then have to shop with many rude people. I just pay full price if I can’t live without it or wait for the online sale. I agree with the comments about making the warehouse sale online. The resellers are ridiculous. Thanks for the news on SBS! I ordered four pair at the sale in January and no one will return my emails or phone calls about when I can expect them. Their customer service is horrible on this “issue” they are having. They really need to send a 25% off coupon with all of these seriously delayed orders. With Jack Rogers doing monogrammed sandals now, they should be worried. A coupon with my SBS order would be a slap in the face at this point- I’m never shopping with them again, and assuming I would (and providing a coupon for that occasion) is arrogance on their part. Awful businesspeople. I am sorry to hear about the woes at Stephen Bonanno but the sandals are a handmade, completely custom item and there just aren’t that many artisans working for him at this time. This said, they are worth waiting for. Compared to the Jack Rogers “Navajo”, a rip-off of the original Bonanno design, the Jack Rogers sandal had a man made sole which is in no way as comfortable as the Bonanno and cannot be re-soled, only re-heeled. Being man made, the sole is slippery when wet and becomes uncomfortable after long periods of walking. It also never conforms to the Owner’s particular foot either. Considering the relatively small price difference, I would rather have the Bonanno (and have 3 prs. ) any day. The best thing about the shop is they are literally only 2 miles from my home and are a excellent shoe repair shop too. Hey Princess!!!! I, too, ordered a pair of SBS sandals because I love the pair I have so much that i wanted another one! I have left voicemails, emails, and facebook messages, and no one would return my phone call. Finally, about a week ago, I was able to get a hold of someone at the PB Boutique who said my sandals were in the lacing process and should go out that Friday. Coincidentally, I received a phone call returning one of my several messages to SBS, and the lady at the factory said that I had been given an estimated time. I was like no, ummmm, I’ve never been called back until now speaking with you. She said my sandals should ship out on Friday which was this past Friday. So, we’ll see if they come or not. I ordered them in January. I get they were inundated with orders due to underestimating the power of social media. But what has upset me is the lack of communication from SBS to its customers. I think people would be a lot more understanding if you updated them and let them know what’s going on instead of not returning calls, messages, emails, etc. The corporate LP are only interested in the bottom line – the ‘kerching’ of the till. They don’t care about the Real LP fans nor making it fair for all their Loyal Real customers by limiting buyers to the amounts they can purchase to help curb the rude, boorish re-sellers. I’ve seen some LP murfee scarves on ebay for the same price as a retail store ($118)and sometimes for $175!!! Whaaaaat? Who needs it that much to pay the extortionate amount that a re-seller is demanding? Just wait a while and a reasonably priced one will become available on e/b or at the store sales. Greed and avarice is what drives these unscrupulous re-sellers. Pushing, shoving, grabbing! If you tripped and fell, they’d probably step over you to get to the Lillys! Disappointing – but not surprising – about the LP warehouse sale. I did the online sale last year and was very pleasantly surprised. Waiting in huge lines and fighting with ebay resellers isn’t my idea of a good time, no matter what the savings. As to the Stephen Bonanno sandals…Unfortunately, this company is clearly having problems. I order 2 pairs (one monogrammed, one gold) on 1/23. Received one email response to my question in April from Cole, who said he was forwarding it to the factory. Since then, I’ve talked to several different folks: 1 said they didn’t have my shipping address ( ! ), 1 shop owner said they were very far behind (she was waiting on orders herself), 1 shop owner ‘helping’ at the factory told me my sandals were shipping out 5/31…you get the gist. All of us can understand a company being inundated with orders, and most of us would be willing to wait as long as we were kept up to date honestly. This has not been the case. I’ve only spoken with ONE person who order during the sale and actually received her order. She called a store EVERY DAY for THREE MONTHS! She also lives in the area, so popped in and checked on things frequently. Guess that’s what it takes? As for me…after the last run around, I contacted my credit card company and have been credited for the charge made in January. (Yes. Purchases were charged right away. Given the legal problems SB has had, of which I was unaware until I googled it, this should have been a big red flag!). My company only ‘researched’ this for a day – I’m afraid there have been more complaints of this type regarding SB sandals. Hate to see this company go downhill this way. Their sandals are wonderful, but without honest customer service…well, you don’t have much to go on! I’m going to be scouting around for another great option.